The Hacker News (THN), the widely-read cybersecurity news source for hackers and technologists, is celebrating its 7th Anniversary today. This is a huge milestone for THN and our team, but this day really belongs to you—our readers. Without you, we would not be here, and we appreciate you for reading, commenting, and sharing our content every day. 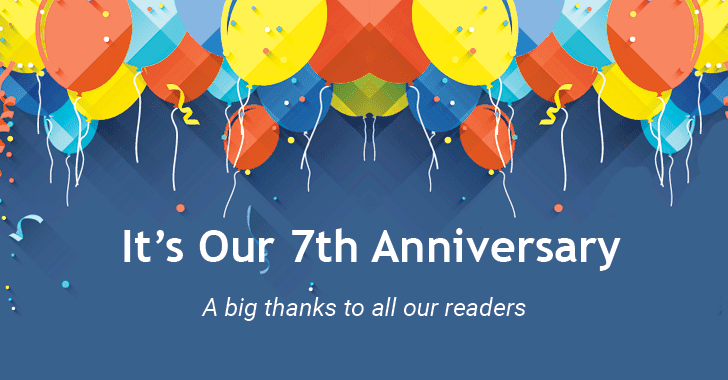 7-years ago today we started this website with an aim to provide a dedicated platform to deliver latest cybersecurity news and threat updates for everyone, including students, enthusiasts, technologists, security researchers and hackers as well. Times flies when you are having fun! "Over 6,700 Posts, 33,500 Comments And 293 Million Pageviews"
We have always admitted that we do not cover everything, never did, never could, we just cover things that are important to our readers and impact a broader audience. So this is the actual difference between The Hacker News and a full-fledged media outlet. Since November 1, 2010, we have brought you more than 6,700 news articles with 33,500 comments and attracted over 293 million page views. The Hacker News is so much more than just a blog—we are a community. If you are reading this, you are already part of our family! The Hacker News has become one of the popular and trusted hacking news channel that attracts more than 10 million monthly readers—all because of readers high enthusiasm. "Over 2 Million Facebook, 412,000 Twitter, 1.6 Million Google+ Followers And 250,000 Email Subscribers." When I look back at where The Hacker News started, I am in awe of how far we have come. Starting a website is always easy, every day thousands of sites launch, but the real challenge is to be consistent, keep it always up-to-date, converting readers into a loyal readership and followers. Regardless of how frequent you visit our site, whether you are a regular reader or just come occasionally, whether you support our website by sharing articles, or are a silent reader, The Hacker News would not be there if you were not there. You can follow our latest feeds on Facebook, Twitter and Instagram as well. Last year we also launched an exclusive deals store with an aim to offer things that you need to take your potential to the next level. Packed with great deals at incredibly low prices, our deal store offers everything from online training courses to gear and gadgets, downloadable security products, privacy services and even drones. We are in the process (beta testing) and working hard to fulfil a promise we did to our readers last year of a new platform that will completely transform the way THN reports and engage with infosec community today. As things are changing so quickly on the Internet, next version (launch is coming soon) of our website will offer much more up-to-date interactive content and opportunities. This is just the beginning, as there are many many more exciting years ahead! Once again, our heartiest thanks to all of you and please let us know if you have any feedback for The Hacker News in the comments below.